Greenpeace International has launched a new petition calling on the multi-national company Procter & Gamble to clean up its supply chain and manufacture only forest-friendly products. According to Greenpeace, Procter & Gamble is sourcing palm oil from companies that are destroying wildlife habitat in Indonesia and pushing critically endangered species like orangutans and tigers closer to extinction. In a new report, ‘P&G’s Dirty Secret’, released today in the Indonesian capital Jakarta, Greenpeace accuses Procter & Gamble of contributing to climate change, key tropical biodiversity loss, and social deprivation. It cites one case in which a palm oil supplier is allegedly linked to killings of orangutans. 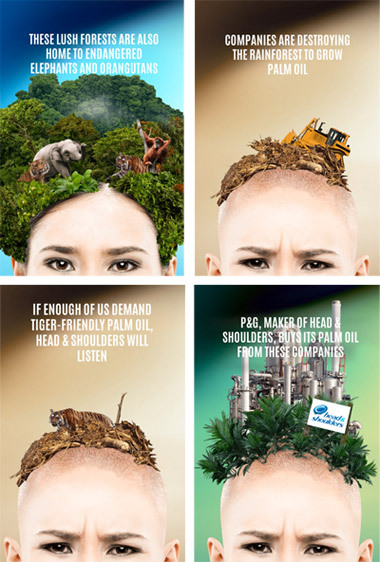 “The makers of Head & Shoulders need to stop bringing rainforest destruction into our showers,” said Bustar Maitar, head of the Indonesian forest campaign at Greenpeace International. “Procter & Gamble must clean up its act and guarantee its customers that these products are forest-friendly. According to the United Nations Environment Programme (UNEP), palm oil plantations are the leading cause of rainforest destruction in Indonesia and Malaysia, who together produce close to 90 percent of the world supply. One area of Indonesia that has been illegally slashed and burned is the Tripa peat forest, which lies within Sumatra’s Leuser Ecosystem – the only place on earth where tigers, elephants, rhinos, and orangutans can be found living together in the wild. In a recent court judgment in Indonesia, one palm oil company, PT Kallista Alam, was fined millions of dollars for illegally burning large swathes of Tripa. Experts say that the Sumatran orangutan and tiger are both on the brink of extinction. Orangutans in Borneo are also seriously endangered. “Progressive palm oil producers in the Palm Oil Innovation Group, along with ambitious commitments from the big palm oil players Golden-Agri Resources and Wilmar, prove that there is a business case for responsible palm oil,” said Bustar Maitar. The food manufacturing company Kellogg recently made a commitment to only buy palm oil that is fully traceable and produced in an “environmentally responsible manner”. It said its suppliers would have to meet specific sourcing criteria by 2015. There have also been new sustainability commitments from Ferrero Chocolates and the Brussels-based food retailing company, the Delhaize Group. These announcements have received a widespread welcome, but there are those that are calling for swifter action. About half of the packaged food now found in supermarkets contains palm oil. It is present in all kinds of produce ranging from biscuits and peanut butter to chocolate and ice cream; it’s in all kinds of ready meals and breakfast cereals, and in shampoo, cosmetics, shaving cream, soap, and industrial lubricants. Palm oil is now also being used to make biofuel, the production of which actually increases greenhouse gas emissions. In its new report, published after a year-long investigation, Greenpeace highlights the activities of the Indonesian palm oil company BW Plantation, which operates in Borneo and is a Procter & Gamble supplier. 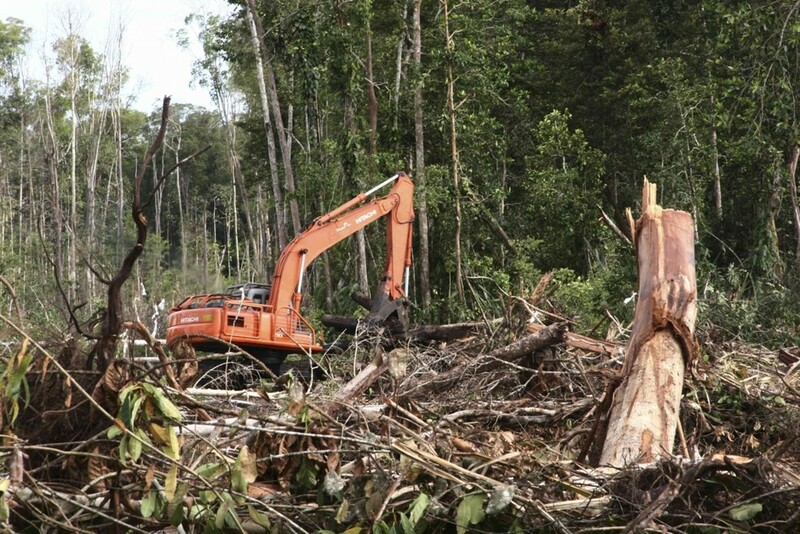 In other cases, Greenpeace has documented ongoing forest clearance within the concessions of two producers known to directly supply Procter & Gamble – the Malaysian multinational Kuala Lumpur Kepong Berhad and the Indonesian company Musim Mas, which has its headquarters in Singapore. The forest campaigner at Greenpeace International, Areeba Hamid, says Greenpeace has been confronting Procter & Gamble over the past eight months. Companies without strong policies to cut deforestation from their products are exposed to illegal practices in high-risk areas like the Sumatran province of Riau, Areeba Hamid says. 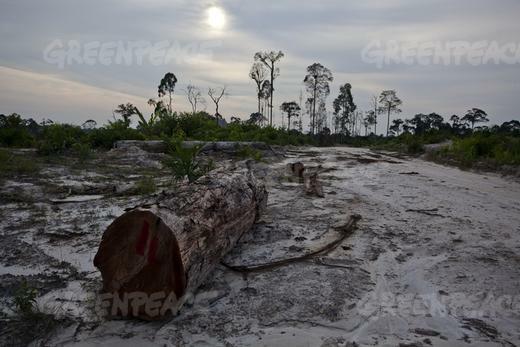 Greenpeace cites the PT Rokan Adi Raya concession, where there were uncontrolled forest-clearing fires last year. The cleared land includes tiger habitat and deep peat. Riau holds 40 percent of Indonesia’s peatland carbon, and contains about one-fifth of the remaining Sumatran tiger habitat. It is Indonesia’s largest palm-oil producing province and the haze from forest clearing in the region regularly spreads as far as neighbouring Malaysia. Greenpeace also gives the example of the Tesso Nilo national park in Riau. The park has one of the world’s highest recorded diversities of plants and supports key populations of critically endangered Sumatran elephants and tigers. “Encroachment by palm oil plantations into tiger conservation landscapes and protected areas continues, severely endangering the long-term health of the forest,” Greenpeace states in its new report. Greenpeace says that even mills certified by the Roundtable on Sustainable Palm Oil (RSPO) have been accepting third-party supplies of oil palm fresh fruit bunches that originate from highly destructive operations – in the case of Tesso Nilo, the illegal clearance of a national park and critical tiger habitat. “Since 2011, the forest complex has lost almost half of its remaining forest cover; in June 2013, only 39,000 hectares of natural forest remained – a mere quarter of the area of the forest complex. According to a WWF field survey of more than 50,000 hectares of encroachment areas inside the Tesso Nilo forest complex in 2011, 70 percent of that land had been converted to oil palm plantations. An investigation by WWF in 2011–2012 exposed how two international palm oil traders – Asian Agri and Wilmar – were involved in the trade of palm oil from the illegal destruction of the Tesso Nilo forest. Both companies have since stopped purchasing fruits from suppliers operating inside the park. The US-based Union of Concerned Scientists (UCS) says the deforestation caused by palm oil production is driving global warming. “Ten percent of all global warming emissions result from deforestation. This practice also destroys irreplaceable forests that are home to endangered species and a resource for forest-dependent communities,” said Sharon Smith, campaign manager for the UCS’s Tropical Forest & Climate Initiative. Procter & Gamble products known to contain palm oil derivatives include Pampers products; detergents such as Ariel, Dash, Lenor, Ace, Tide, Dawn and Gain; Wella and Head & Shoulders hair products; and Gillette and Mach 3 shaving gels. The company’s products are available in more than 180 countries, and the company is estimated to have 4.8 billion customers worldwide. Greenpeace says the company’s submissions to the RSPO are “minimally informative” and add little that aids understanding of its commitments and targets. The RSPO has itself been heavily criticised for having inadequate guidelines. Certified sustainable palm oil is not guaranteed to be deforestation-free. Under Indonesian law, development on peat up to three meters deep is still legal, and the RSPO does not ban all development on peat. The UCS says the RSPO standards “do not yet represent the best science regarding forest conservation and carbon emissions”. Indonesia’s peatlands cover less than 0.1 per cent of the Earth’s surface, but their destruction is causing 4 per cent of global greenhouse gas emissions every year. 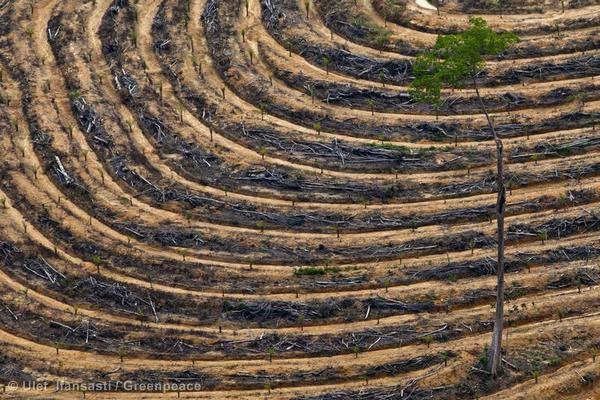 Indonesia’s forests are disappearing at a rate of more than nine Olympic swimming pools each minute, Greenpeace states, and palm oil is the biggest driver of forest destruction. The scientists union has welcomed the new commitments by Kellogg and others. “Palm oil can be grown without destroying tropical forests or our climate,” said Sharon Smith. The real question, Smith said, was whether companies were moving fast enough and aggressively enough in the face of such a rapidly changing climate. Greenpeace says that the recent commitments from suppliers and consumer companies give strong indications that something is changing in the palm oil industry, and that the industry can finally move away from a bad reputation fuelled by decades of forest destruction. It states, however, that the reaction from the rest of the industry to those instigating change is a cause for concern. “Indonesian producers have met the progress shown by Golden-Agri Resources and Wilmar with stony silence. By contrast, the Malaysian industry is actively pushing back in the press. It claims that Wilmar’s new commitment will undermine the industry. Forest destruction in Sumatra; photo by Roni Bintang. Greenpeace is calling on Procter & Gamble and other user companies to recognise the true costs of irresponsible palm oil production. “They need to ensure that their palm oil supply makes a genuine contribution to Indonesia’s development, rather than destroying the future for its people, its wildlife and the global climate on which we all depend. As recently as the 1960s, 82 percent of Indonesia was covered with tropical rainforests, but the country now has one of the fastest deforestation rates in the world. 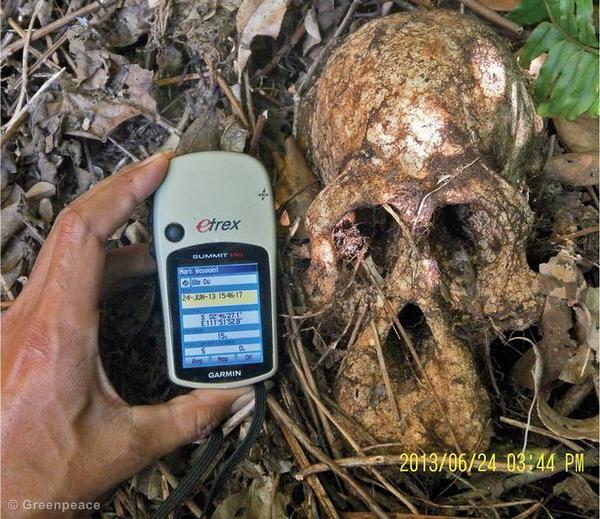 A Greenpeace investigation with The Friends of the National Park (FNPI) documents an orangutan skull beside an oil palm plantation owned by PT Bumi Langgeng Perdanatrada, a subsidiary of BW Plantation Group, near Tanjung Puting National Park in Central Kalimantan.